OrthoVista is the most powerful professional mosaicking product in use world-wide. It utilizes advanced image processing techniques to automatically adjust and combine orthophotos from any source into one single seamless, color-balanced mosaic. 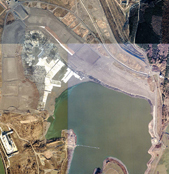 OrthoVista improves the efficiency, quality and profitability of digital orthophoto mosaic production. OrthoVista is part of inpho�s digital photogrammetric system. OrthoVista automatically compensates for a wide range of image intensity and color variations originating from the imaging process. OrthoVista computes radiometric adjustments that compensate for visual effects within individual images, such as hot spots, lens vignetting and color variations. Further, OrthoVista performs a blockwide color balancing by adjusting adjacent images to match in color and brightness. Multiple orthophotos are combined into one seamless, color balanced and geometrically perfect orthomosaic. OrthoVista is designed for processing the most demanding photogrammetric projects with block sizes of 20000 images and even more. Handles orthophotos from any source. Projects with 20000 orthophotos and more can be processed. Unique true-ortho functionality in combination with inpho�s OrthoMaster product.